Going to the Sahara has always been on my bucket list. Just imagine…the biggest desert in the world! It must be something very otherworldly, something very different. This summer I had the chance to make it a reality. We were going to Marrakech in Morocco at last! 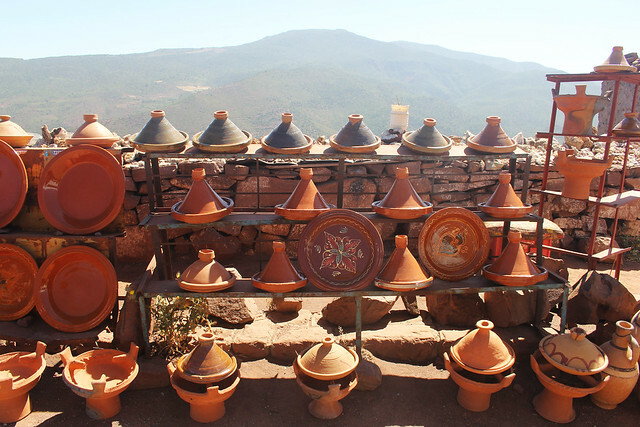 We talked to some Moroccan friends (plus some from other parts of North Africa) so that we could make it a reality; they recommended a tour from Marrakech. 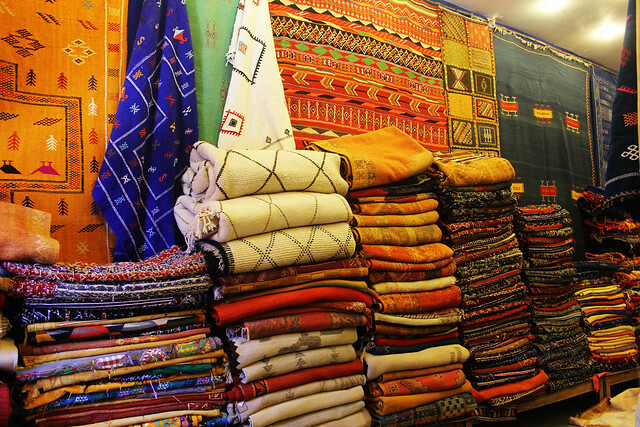 We decided to book it, along with another day trip to Essaouira, which you can read here. The tour picked us up at the hotel and met with other people at the Jemaa El-Fnaa main square. 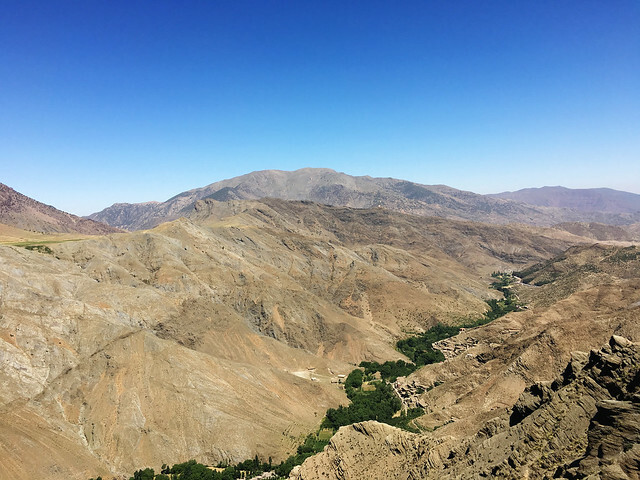 Out of the city we went, up the Atlas mountains. 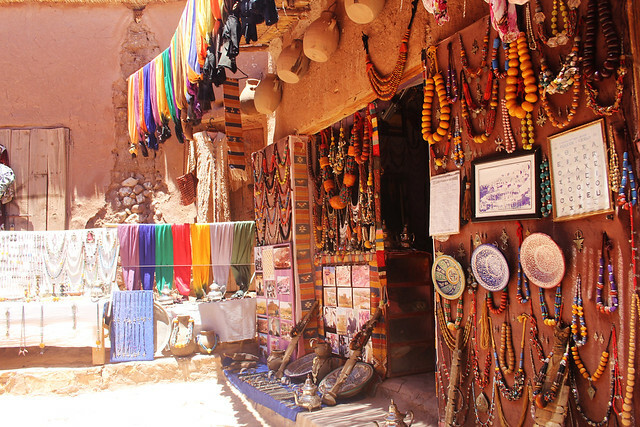 We stopped by occasionally to visit Berber shops on top of the Atlas Mountains, to stretch our legs, and to appreciate the view. 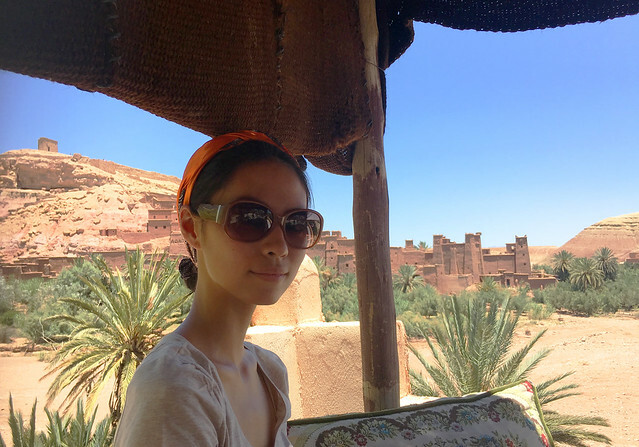 Then we arrived at Ait Benhaddou in Ouarzazate. It was a UNESCO site; a fortified city along the Sahara trading route. We saw a cluster of homes, maze-like streets, and community areas. The heat was horrible (it was, after all, summer in a desert), but the moment we stepped inside one of the homes, it cooled down considerably. Our guide explained that the materials used for the construction of these homes keep the homes cool in summers and warm in winters. 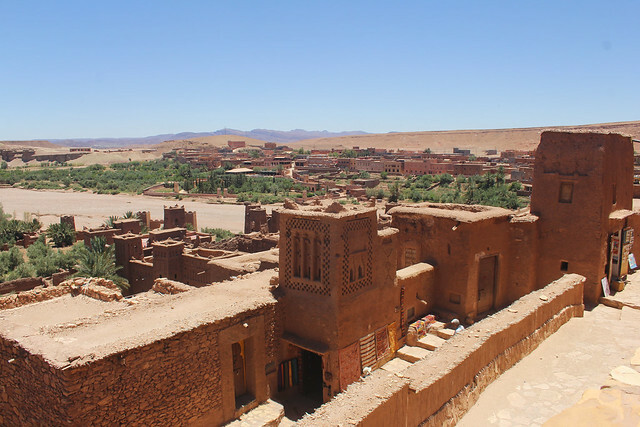 Most of the inhabitants of Ait Benhaddou now live in a neighboring, more modern city…only four families constantly reside there. We saw one of them, an artist who painted with ink that could only be discerned after we put the paper on top of a fire (the traditional mode of espionage). Ait Benhaddou has been used as movie sets on many occasions. Our guide was an extra in Lawrence of Arabia and Gladiator! Afterwards we had lunch, then set out once again. 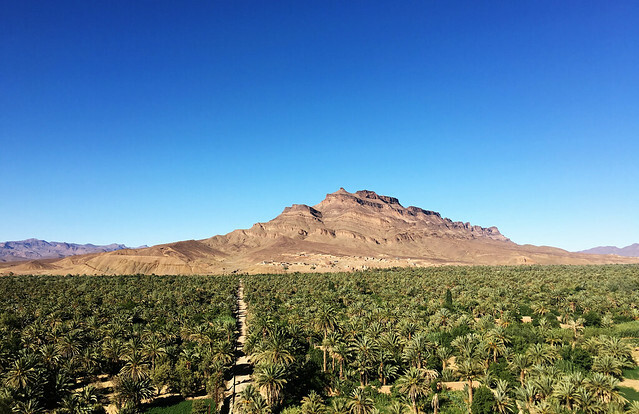 On the way to the desert, we saw palmeries, magnificent mountain landscapes, and an oasis that sprung up suddenly, taking all of us by surprise. We left the villages and drove about an hour into the desert, until the road stopped. There were camels waiting to take us to camp. We rode into the sunset and reached our destination just as the sun disappeared. 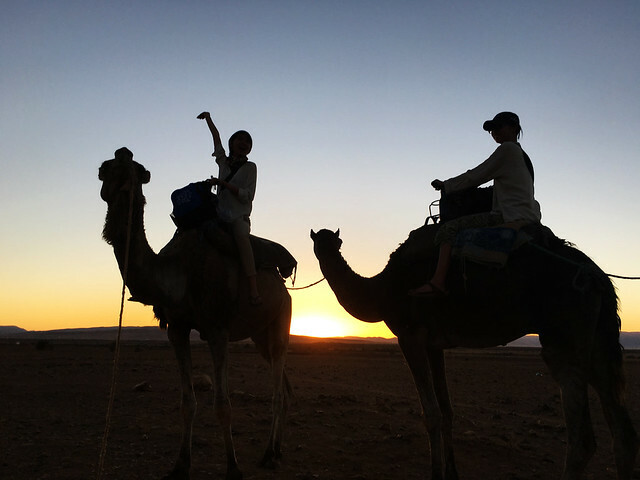 Camping in the Sahara was magical. We met and talked with the local people, drank tea together, and played music. 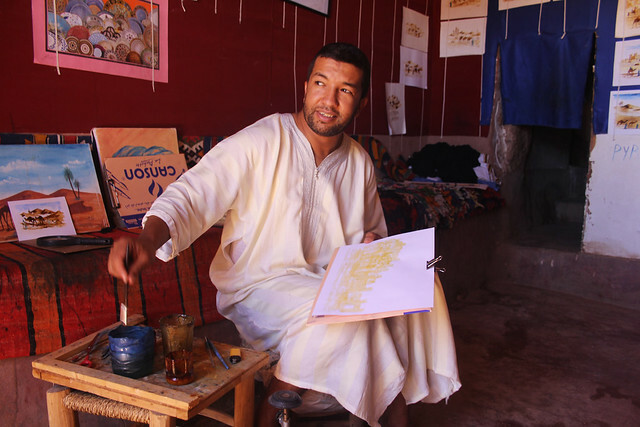 One man told us that he was a shepherd from a nomadic family, but because the desert had been drier than usual the past few years, he had taken up residence in one of the Berber villages. We ate tajine, then lay down on cushions and carpets spread in front of our camp. I spent hours looking at the sky…there were so many stars. That night, we couldn’t sleep. The silence was so absolute, broken only by our breathing and the occasional gust of wind shifting through the rocks and sands (it was almost like a song). 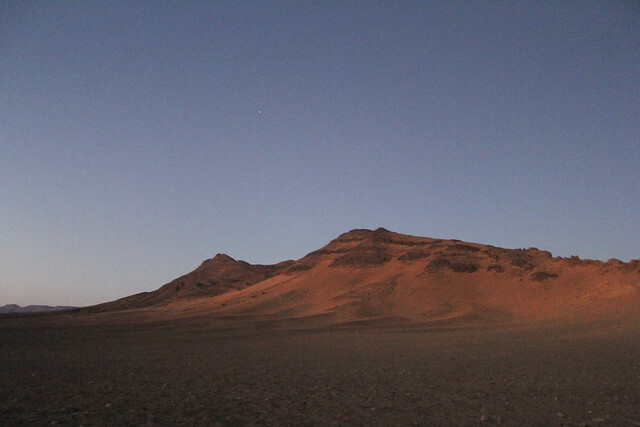 When everyone was asleep, we went out of our tent and looked up at the sky. 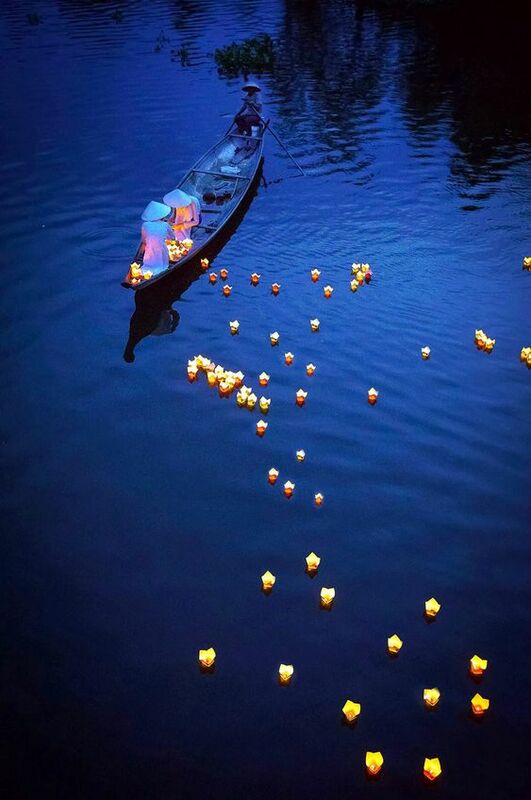 Without the glow from the lamps, the stars were even more brilliant. We don’t have many pictures that night, but what we experienced would last a lifetime. The next sunrise, we had breakfast and tea. 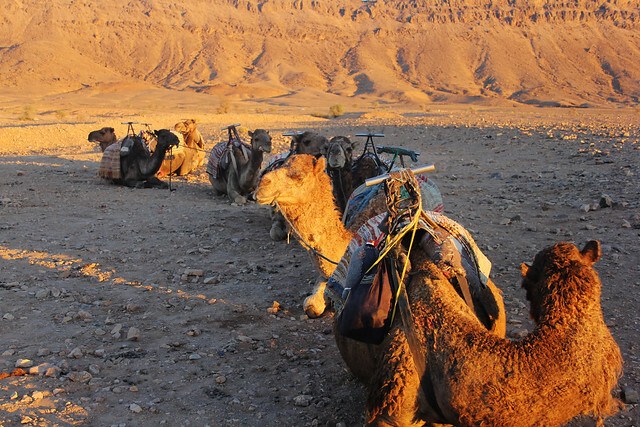 We hopped on the camels and went back to the van. 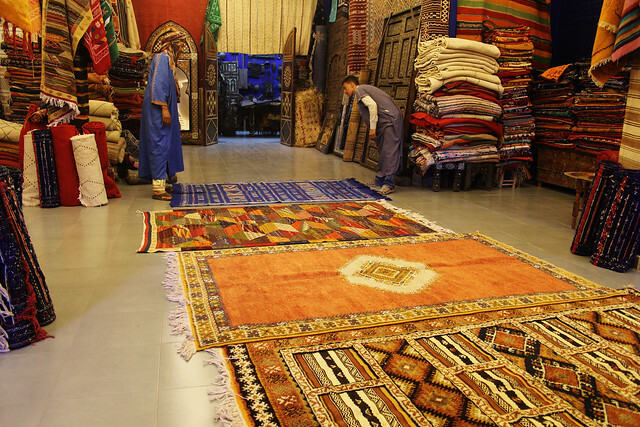 We stopped in Ouarzazate again on our way back to Marrakech and visited a very interesting shop (there were so many things there, from colorful carpets to decorative weapons). We arrived at the city at seven, exhausted but still thrilled. Comparing my expectations and my experience, I would say that it was gloriously different. We didn’t go to the part of Sahara with the sandy dunes. Zagora had some sand dunes, but they were not the miles-long kinds I imagined…most of the landscape was rocky (as is, our guide said, most of the Sahara desert). But there is truly no word to describe the feelings I felt and the thought I had, looking at the stars and at the unadulterated landscape. In the city, I often felt as though I was the center of the world…there, under a vast, vast sky, looking at the seemingly endless desert, I remembered that I was only another person, one among many, like a grain of sand in the sea around me. This entry was posted in Nature, People and Culture and tagged adventure, ait, ait benhaddou, backpacker, ben, camping, camping in the sahara, camping sahara desert, camping with berber, culture, desert, experience, foreigners in sahara, haddou, historical, history, how to camp in the sahara, is it safe to camp in the sahara, marrakech, marrakesh, morocco, mypassengerdiaries, nature, on budget travel, ouarzazate, personal experience, photography, sahara, student travel, tour to sahara, tourism, tourist in sahara, travel, traveling, wanderlust, what to do in marrakech. Bookmark the permalink. That sounds so amazing! Think I’ll have to add it to my list for next time! I’m with you – it’s exciting! I flew over the Sahara as a small kid many decades ago and always sat with my nose pressed up to the window to look down on that huge expanse (hoping to see a camel train from may thousands of feet!). Some years ago we touched on the sandy edge (Great eastern Erg) of the desert at Douz, Tunisia, and I found it a thrill. The sand was so unexpectedly fine and seemed to silence all that touched it, and it was amazing to look pretty much due south towards Nigeria where I lived as a kid, and think what an expanse of desert lay between us and the next major centre of population….